We are continuously seeking the next advancement that improves patients’ outcomes. Final frontiers don’t exist for Montefiore’s Department of Neurological Surgery. Our curiosity won’t allow for them. We know every time we find an answer to “Why not?” we will be presented with a new round of “What-ifs?” Daunting for some but inspiring for us, we don’t stop at a published paper or peer recognition. Our initiative carries over into the examination room to drive diagnoses and treatment plans to get patients functioning again. Our research team includes lab-based researchers (also known as basic scientists), clinical-based physician researchers and postdoctoral researchers, all working together to develop new neurological surgery treatments and protocols. This unique collaboration allows our research team to create and validate lab models in conjunction with clinical data to bring research from the lab to patients. The Department of Neurological Surgery is committed to research. One key focus of our laboratories is studying the basal ganglia, a group of structures located in the center of the brain hemispheres (also known as the cerebral hemispheres), and their role in learning and motivation. We are conducting research to better understand this along with the transmission of signals that are involved in brain function. Our team utilizes multiple approaches to understand both the physiology and neuropharmacology (the study of drugs and their impact on the nervous system) of these circuits. The basal ganglia are a group of large nuclei (the controlling mechanisms of cells) located in the center of the brain. For decades, the role of this region and its impact on brain health was defined by disorders, such as Parkinson's or Huntington's disease, that are caused by a disruption to basal ganglia. Fortunately, recent advances enable us to directly study basal ganglia. Exciting new data suggest that this area of the brain plays a critical and previously underappreciated role in learning and motivation. The input region of the basal ganglia, that receive signals to the basal ganglia is called the striatum. The striatum comprises three nuclei called the putamen, caudate and nucleus accumbens. These nuclei are extremely interesting because of their connections and strong dopamine input. Dopamine is a chemical released by nerve cells and is believed to play an important role in learning and motivation, as it provides a feedback signal during learning that rewards the brain by creatiing positive biological responses for an individual. There are two streams of information processing in the striatum, dorsal and ventral, that perform complementary, but different, roles. Specifically, we hypothesize that the dorsal stream, which includes the caudate nucleus, is involved in associative learning, whereas the ventral stream, which includes the nucleus accumbens, is involved in providing motivation for the performance of learned behaviors. 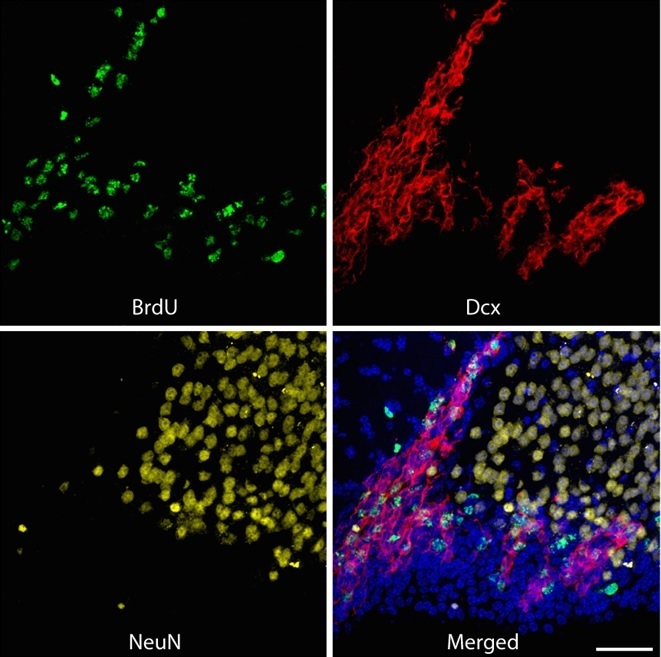 Generation of new neurons following treatment of a traumatic brain injury. We use microelectrode, single-neuron recordings to evaluate the activity of neurons performing associative learning and motivational tasks. The data are obtained in the laboratory and intraoperatively. This is a unique approach because ideas from the laboratory can be tested quickly in clinical care and vice versa. In addition to standard microelectrode techniques, we also employ the electrochemical technique of fixed-potential amperometry. This technique uses carbon-fiber electrodes to record dopamine fluctuations during learning. Finally, to go beyond correlation and begin to understand the cause, we also employ microstimulation. For example, in one set of experiments, we discovered that intermittent electrical stimulation enhances learning beyond baseline rates. We are currently exploring the use of such intermittent stimulation to promote recovery in patients who have suffered from a stroke or traumatic brain injury.